In Blue Orchids, Grimonprez creates a double portrait of two experts situated on opposite ends of the same issue––the global arms trade. 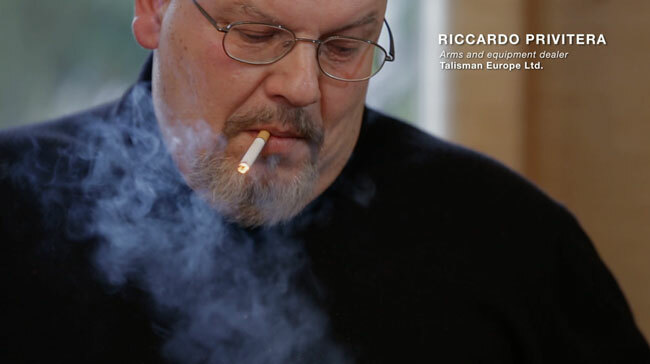 The stories of Chris Hedges, the former war correspondent of The New York Times, and Riccardo Privitera, a former arms & equipment dealer of Talisman Europe Ltd (nowdissolved), provide an unusual and disturbing context for shocking revelations about the industry of war. While interviewing Privitera and Hedges for Grimonprez’s recently released feature Shadow World (2016), it became clear that the two men were describing the same anguish and the same trauma, but from paradoxical perspectives. One has dedicated his life to unmasking lies and the other has built his life on lies. Both their personal and political histories gradually reveal the depths of suffering and duplicity, situating the arms trade as a symptom of a profound illness: greed. 2016, Belgium, 46 min, colour, english, stereo.